This pregnancy is very similar to my pregnancy with Willow when it comes to symptoms, but how I'm coping with it is very, very different. My baby bump isn't as obvious, due to being several stones heavier in weight than I was when I was pregnant with Willow. I'm 3 dress sizes bigger than I was when pregnant with Willow and that is largely down to a much bigger stomach; I piled on 6.5stone when pregnant with Willow and didn't lose any of that weight for 2 years. At the new year, I told myself enough was enough and decided to crack on with the weight loss, but I had only lost 1 stone before finding out we were expecting this little baby, so I was still extremely overweight and much larger than I would like to have been when we conceived. I knew even before I made it to my booking appointment at 8 weeks that I would be classed as 'high risk' for this pregnancy, not just because of my weight, but because I had an emergency caesarean with Willow. Since then it's been quite the emotional rollercoaster and being high risk and under consultant led care has been daunting and at times, difficult for me to process. The care you receive under both midwife and consultant led care will, of course, differ for each individual expectant parent and so this is purely my experience; I can only share the care I am receiving and how I am finding that care; others may have less or more appointments and will have different reasons for being given extra care. I still see my midwife, although as this is my second pregnancy the appointments are less often than they were when I was pregnant with Willow. Due to being a high-risk pregnancy, I was also on a higher dose of Folic Acid until 13 weeks and have been given a higher dose of Vitamin D to take as well alongside my usual pregnancy vitamins (I've opted for Pregnacare again, which I used when pregnant with Willow). For me, being under consultant led care means that I have more frequent hospital-based appointments, I'll be tested for gestational diabetes throughout this pregnancy like I was with Willow, but more frequently (I've already had one glucose tolerance test at 15 weeks with my second booked for 28 weeks). It also means that I have more scans to check baby is OK and growing well, with these scans becoming more frequent from 28 weeks and taking place every 4 weeks. After each scan, I also see my consultant, so these appointments for the scan and seeing the consultant can often take up to 4 hours with waiting times in between the two, always fun and interesting with a toddler in tow! Scans have, so far, been problem free. I have had scans at 7 weeks (to rule out an ectopic pregnancy), 12 weeks (for my dating scan), 18 weeks (due to worries over my scar) and 20 weeks (for my anomaly scan). Each scan, despite my very large tummy, has been done externally with no problems - I was a little worried I may need an internal exam with my 7-week scan because I was so early on as well as my 20-week scan, due to the sheer amount of fat around my middle. Although I did have to lift my fat up and out of the way as much as possible for the 12 and 20-week scans, with the latter being far more uncomfortable than my 20-week scan had been with Willow. Whilst I haven't exactly been berated for being obese, the focus during my consultant appointments has mainly been on my weight and especially my BMI. 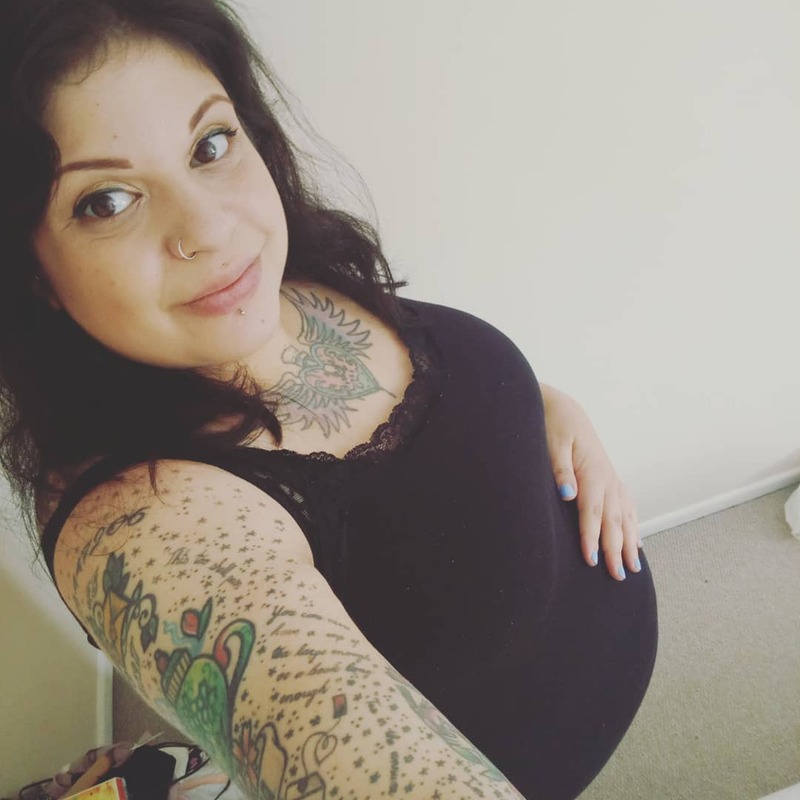 I went into my first appointment really optimistic about having a VBAC (vaginal birth after caesarean) and using hypnobirthing to get into the right frame of mind, to be shot down pretty quickly with facts and figures about success rates for women with BMI's as high as mine. To be quite honest, I've been entirely scared off of a VBAC and I do think scared off is the right way to describe it, because ultimately, women bigger than me have managed VBAC's with success, but being told I will end up with another emergency caesarean or that my caesarean scar is more likely to rupture and put both my life and babies life at risk, is a pretty scary thought. It's simply not a risk I feel comfortable taking - even though the risks associated with caesareans are anything but small. That said, the consultants I have seen haven't chastised me for my weight, they have just been blunt about the facts, which I have gone on to research in my own time and the statistics for women with BMI's as high as mine really are low for successful VBACs. So, although I would have loved to have gone ahead with the idea of a VBAC and not had to go through the recovery of major abdominal surgery again, I have, for the meantime, accepted that a planned caesarean is the more realistic way for me to birth this baby, no matter how hard emotionally that is for me to accept. There are a lot of factors you have to consider when you're plus size, pregnant and high risk, this merely covers the more basic and probably more common aspects of my care. There are a few things I plan to discuss in more detail in future posts, such as dealing with extra gestational diabetes tests and the way my weight changes are being approached during this pregnancy, but for now, I wanted to share my feelings on being a high-risk pregnancy. I would have much preferred to have lost the 'baby weight' before expecting another little one and avoiding the extra care (particularly because I feel, as I have yet to encounter any problems with this pregnancy associated with my weight, that it is an unnecessary expense to the NHS), but this is my situation for this pregnancy and the upsides of seeing my baby more often with frequent scans do lessen the blow of being high-risk. If you are also high-risk or have had a high-risk pregnancy in the past, I would love for you to share your experiences with me. I don't think you look any different to any pregnant woman! You have a big baby bump, which is perfectly normal! I had pre eclampsia in my first pregnancy and was therefore considered high risk for my second. I was obese when I became pregnant the second time, with a BMI of around 32 but nothing was really mentioned about it, other than one nurse at my GP surgery telling me to watch my weight and not put too much on. I knew I would be high risk and I was pleased that I was as it meant I would get extra care and the likeliehood of a successful healthy baby and mum at the end would be higher. I didn't mind all the extra checks and monitoring, but I was pissed off that I couldn't have a water birth or was told I wouldn't even be able to use the pool as I would have to be monitored throughout the labour. I was expecting to be induced early and nearing the end of the pregnancy they did keep saying that maybe next week, but due to the monitoring and checks I was able to go right up until my due date, which was when I was going to be induced but nature worked really well and my daughter was born without inducing 45 minutes past midnight on her due date! And all was well with us both. Try not to get too upset about all of this. It is what it is and at the end of the day a healthy mum and baby at the end if all that really matters. Vaginal births aren't the most wonderful of things anyway, and the risk of prolapse later on is much higher for people who have had vaginal births rather than c-sections , pros and cons to everything!